Jason Crane interviews drummer and composer E.J. Strickland. 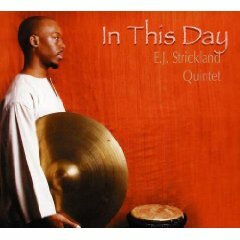 Strickland’s new album is called In This Day (Strick Muzik, 2009). E.J. and his twin brother Marcus grew up in Miami, sons of a musical father. They knew early on that they wanted to be musicians, and they’ve pursued that path with a single-minded devotion. On In This Day, E.J. Strickland’s vision is realized not just from the drum chair, but compositionally as well. He wrote or co-wrote every tune on the record.